HARRY BORGMAN is an artist whose professional career has embraced both the commercial and fine art worlds. He worked for many years as a graphic designer and illustrator before joining the advertising agency Campbell- Ewald in Detroit, where he was head art director on the Chevrolet account designing catalogs, sales promotion material, and later the magazine ads. He has won many awards for his graphic design work and illustrations. He worked for major clients in Detroit, Chicago, New York, San Francisco and Los Angeles. As a teacher he was Chairman of the Advertising Department at the Society of Arts and Crafts (now the College for Creative Studies) in Detroit. His courses included advertising design, illustration and cartooning. In 1977 he moved to Paris where he soon established himself as an artist for the top advertising agencies there. He also worked in the fine arts and exhibited in all of the major French painting salons He also worked in Vienna creating automotive campaigns. He also taught layout rendering in Jakarta and Singapore as well as in Madrid. Next he moved to New York City where he spent ten years working in advertising doing illustrations and graphic design projects. 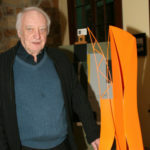 He also exhibited his paintings and sculpture in the Allen Wincor Gallery. He now lives in Sawyer, Michigan and devotes his full time to fine art projects. In addition, he sculpts a variety of subjects in wood, designs metal and wood constructions. He has exhibited his digital prints, paintings and sculpture in galleries, art centers and museums. He has written several art technique books that were published by Watson-Guptill Publications, including “Pen and Pencil Drawing Techniques”, which has recently been reprinted by Dover Publications. His recent books are “Art Therapy” a book of his cartoons about the fine art world, “Surrealities”, a book of his photomontages, and “Digital Dreams” a book that explores the computer as an art medium.